The inspiring memoir of an ordinary American who turned his brief brush with opulence into a joyful adventure of investing in the world’s working poor. Hired by ForbesTraveler.com to review some of the most luxurious accommodations on earth, and then inspired by a chance encounter in Dubai with the impoverished workers whose backbreaking jobs created such opulence, Bob Harris had an epiphany: He would turn his own good fortune into an effort to make lives like theirs better. Bob found his way to Kiva.org, the leading portal through which individuals make microloans all over the world: for as little as twenty-five to fifty dollars, businesses are financed and people are uplifted. Astonishingly, the repayment rate was nearly 99 percent, so he reloaned the money to others over and over again. After making hundreds of microloans online, Bob wanted to see the results first-hand. In The International Bank of Bob he travels from Peru and Bosnia to Rwanda and Cambodia, introducing us to some of the most inspiring and enterprising people we’ve ever met, while illuminating day-to-day life—political and emotional—in parts of the world that Americans never see. 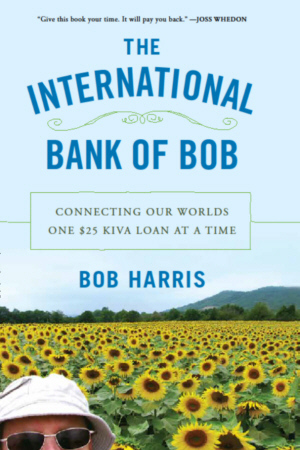 Told with humor and compassion, The International Bank of Bob brings the world to our doorstep, and makes clear that each of us can, actually, make it better.